The latest installment!!! I'm almost done! I have added one final glaze on the background leaves and I also did a little "tweaking" on the values of the flower head. I'm not totally crazy about the background yet. I think it needs something subtle, it looks a little too purple. I went through the image with a fine tooth comb to see if there were any areas that looked too unfinished. That technical illustrator in me is coming out, I'm afraid. I really like my paintings to look as good close up as they do from a distance. I have added a touch of Prussian Blue to the green leaf just above the yellow flower elements to create contrast and punch the yellow just a bit more. Next installment should be the final painting! Stay tuned. 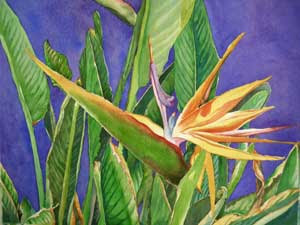 To find out more about my classes and most recent work, please visit my website: http://watercolorworksart.com.